At Las Villas del Guayabo you can enjoy DX’ing and contesting from beautiful Costa Rica in the foothills of Miravalles volcano. Our villas have spectacular views from a hill-side overlooking lower valleys toward western Costa Rica and local volcanos to the east. Each villa has two bedrooms, a main family room (typically used by amateur radio operators while DX’ing and contesting), a formal dining area, a kitchen (with all new appliances) and your own washer and dryer. Included in your rental is Internet access, a local telephone and long distance calls to the United States and Canada. Click here for more information. We can provide assistance setting up our two 50-foot towers for your antennas whether they are simple dipole, beam or multi-band antennas while operating … or you can use existing G5RV full size antenna to operate 75-10 HF bands. We try to keep enough gear on-site so that you can bring a minimum amount of equipment. Please contact us for a detailed list. 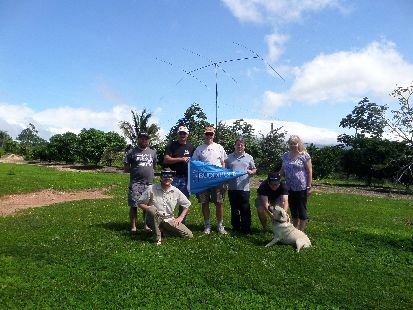 Costa Rica is considered a sought-after DX country for contests by most Amateur Radio enthusiasts and you will receive many a thank you during a contest. 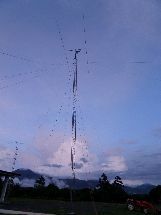 You also will notice before and after contests the pile up’s of stations wanting to work with a Costa Rican station. The first Amateur Radio Operators to visit the villas contacted 300 countries / regions in a two-day contest weekend event with over 3,100 QSO’s, including some rare contacts to the Antarctic and the South Pole! 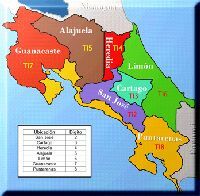 From the villas, you will be using TI7/ prefixing your own Amateur Radio call-sign in the Guanacaste region of the country. For example, if your call-sign is W1AW, you will use TI7/W1AW. Every contesting program does this for you automatically and, if needed, you can print your logs here at the villas. Upon arrival at the Liberia Airport, you'll first pass through Immigration (Migración) where you will show your passport for entry into the country. Your passport's expiration date must be more than 90 days from your arrival date! The immigration agent will ask where you are travelling (tell them Guayabo de Bagaces) and when you will leave Costa Rica. We suggest having a printed copy of your travel itinerary that shows the date of your return flight. Once you've received your passport's entry stamp, you'll proceed to collect your baggage. There are two luggage carousels and the Liberia airport staff are quite prompt in unloading the luggage! Gather all your bags and head to the Customs (Aduana) area. Each person entering Costa Rica is officially allowed to bring 5 liters of liquor, 500 grams of tobacco and (every 6 months) up to USD$500 of resell-able merchandise. The value of any item that you declare (or that a customs official questions) is what you say it is — no invoices are required. Cameras, computers, and other electronic equipment for personal use are permitted duty-free, but if you have more than two of any item a customs official might question your intent. The first group of amateur-radio operators that visited the villas had no issue going through customs. If the customs official decides to stamp your passport, the only down-side is that you cannot use that passport to import additional "merchandise" for the next six (6) months. Note: In the U.S., TSA may require you power up your radios to prove they function for that purpose per the new rules established in 2014. Make sure you have the power cord, battery or light weight power adapter with the your radio equipment (not in separate checked bag). 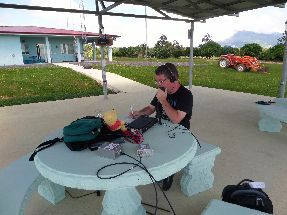 Costa Rica is part of the Inter-America Convention and an International Amateur Radio Permit (IARP) allows Inter-American amateur radio operators to temporarily operate stations outside of their home region. Your permit application (and additional information) can be obtained from the ARRL: http://www.arrl.org/iarp. An IARP costs between USD$10 and USD$40, depending on the shipping method you choose and is good for 365 days before renewal is required; refer to the AARL site for details. Your IARP is a passport-size document with multiple language information for authorities if you are stopped, your passport-size picture and a stamped AARL seal. You also get a copy of the CEPT agreement which is good for Europe: http://www.arrl.org/cept. A copy of your IARP is retained at ARRL headquarters, in case of questions or loss. Costa Rica requires a permit for operation which can be obtained from the SUTEL website by downloading (In Spanish, opens in a new window) the Manual del Radioaficionado (Amateur Radio Operators' handbook). Appendix 1 contains the form to be filled out to gain this permit. We've downloaded that appendix and created a fillable form field version of the PDF (opens in a new window) to make it easier for you to fill out1,2. We also have a sample version of the form (opens in a new window), letting you know which fields are required and what information you need to supply for each field. Just follow the guidance in the sample and, once you've filled in your information, click the Submit button at the bottom of the form … your default e-mail program will open with the filled-out form included as an attachment. You'll also need to attach a copy of the first page of your current passport (with your picture and signature) and a copy of your IARP. If you have any questions or comments, include them in the email. Your permit application should be submitted about four (4) months prior to your visit. Once we receive your application, we will check your forms and then forward that information to our contact in the Costa Rican government. Once the form is approved, all you'll need to do when you get here is email our contact a photocopy of your passport with the current Costa Rican immigration stamp! Note: A new application is required each time you visit. Click the Open menu icon (three horizontal lines, at the top-right of the screen). For each of the Adobe Acrobat Forms Document content types, change the action to either Always ask or Use Acrobat Reader. 2Some versions of Apple devices (e.g. iPhones and iPads) don't support editable, form-fillable PDFs. In that case, you'll need to either use a different device or print the PDF, fill it out and then either scan or take pictures of the result and email it to us. If you have questions, please contact us. While you're here, you can enjoy 4-wheeling or horseback riding on the well-groomed trails on our 250 acres. You can get tour of our orchards and see the toucans, parrots and (if they're in the mood) monkeys that live in our old-growth forest. Within a half-hour, there is a zip-line off the side of the Miravalles volcano with 11 different zip Lines — a most awesome experience! There are also several hot-springs close by. A bit further (about an hour), you could take a river-rafting trip. Click here for details.